Every paper airplane flies differently based on its layout and aerodynamics. Therefore, there are hundreds of different types of airplanes to make. They are easy and fun for both kids and adults, whether you want to learn how airplanes fly or are looking for a creative way to send someone a note across the office. 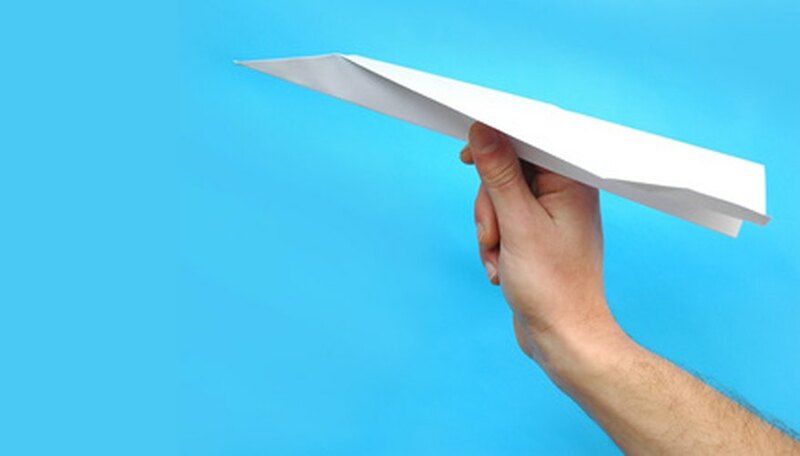 All you need is one regular piece of paper to get started with a basic airplane. Place a rectangular piece of paper horizontally on a flat surface. Fold the bottom edge of the paper up to meet the top edge, creating a center crease across the paper and forming a long rectangle. Take the top left corner, and fold the front layer to meet the bottom edge, forming a small right triangle. Flip the paper over and repeat step three on the other side, instead folding down the top right corner. The two triangles will be perfectly aligned. Take the front layer’s top-most corner on the right side and fold it down to meet the bottom edge. It will create a narrow triangle and form a sharp tip at the bottom-right corner. Flip the paper over and repeat step five on the other side, instead folding down the left corner. The two narrow triangles on each side, again, will be perfectly aligned. Fold the entire front layer in half, folding it down toward you. It will form a diagonal crease to the pointed tip on the bottom-left corner of the model. Flip the paper over and repeat step seven on the other side. Lift the two wings up so they are parallel to the ground. Grasp the body of the plane below the wings before you fly the airplane. Amy Dombrower is a journalist and freelance writer living in Chicago. She worked in the newspaper industry for three years and enjoys writing about technology, health, paper crafts and life improvement. Some of her passions are graphic design, movies, music and fitness. Dombrower earned her Bachelor of Arts in journalism from The University of North Carolina at Chapel Hill.